If you have a baby and you planned to go traveling with your baby, of course you need to bring surprising amount of stuff to make your traveling much easier. You need to bring diapers, blankets, wipes, your baby’s favorite toys, pacifiers and all stuffs that can make your baby feel safe and comfort. One important thing that you have to prepare is a baby travel bed. 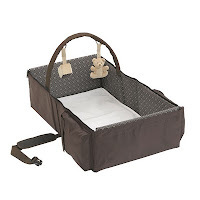 There are many baby travel bed you can find in stores, but I recommend you this one, Eddie Bauer Infant Travel Bed. I’ve just bought one from babysafetravel.com. During my travel with my baby Sheva, this travel bed helped me a lot. Sheva looks very comfortable in it. The collapsible frame, the padded bottom and sides, fitted sheets and nylon surface make this baby travel bed is a must have item for parents of newborn to 6 months baby. With only $28.99 you can have this amazing infant travel bed including two mobile soft toys. If you buy this, it only takes 1 business day for shipping. I planned to buy one more as a gift to my friend. She planned to go traveling with her baby to Canada and I am sure she will be very happy to bring this eddie bauer infant travel bed in the trip.